Just across Lawd (or Lord) canal, about a block from the Grand Palace, is the beautiful temple of Wat Ratchabophit. The temple was commissioned by Rama V late in the nineteenth century. Wish you could have this information with you when you visit Wat Ratchabophit? Now you can. Check out our downloadable eGuides. The temple's unique design has the large wiharn (prayer hall) and ubosot (ordination hall) linked by a circular courtyard. 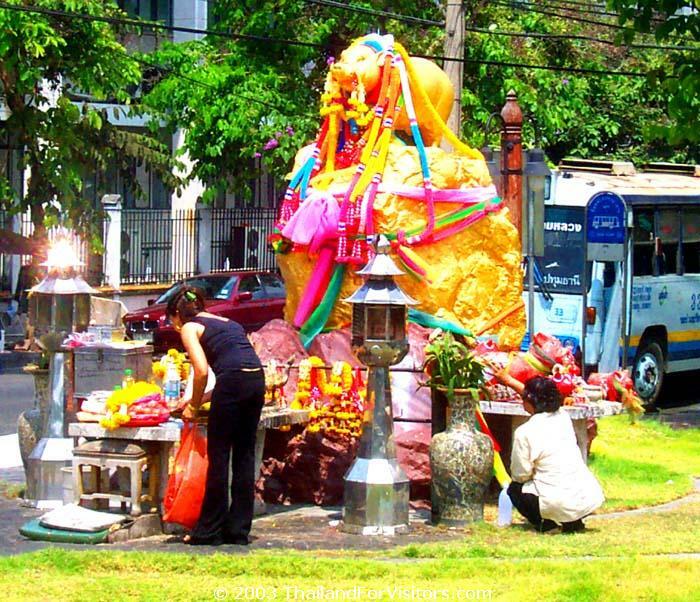 In most Thai temples, the ubosot sits on its own in a square courtyard. In the center of Wat Ratchabophit's courtyard, between the ubosot and the wiharn, is a large gilded chedi (pagoda) containing a seated Lopburi-style Buddha image. The chedi rising above its courtyard. The outside door to the wiharn. The outside of the buildings are decorated with hand-painted glazed tiles similar to Thai benjarong enamels. 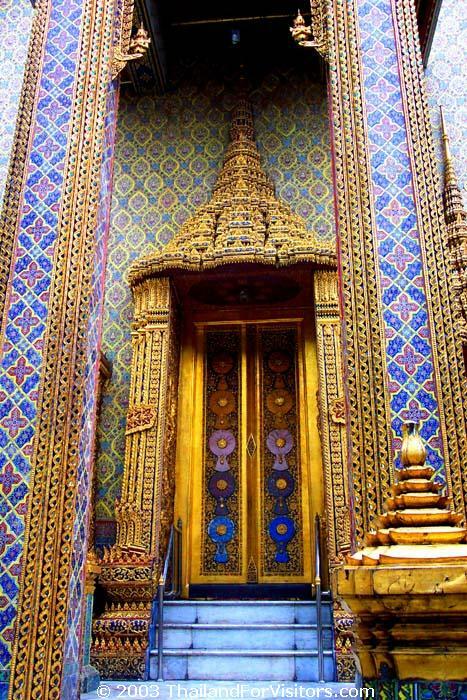 The door and window frames are elaborately decorated with gold and mirrors. South of the temple buildings is the housing area for the monks and workers of the temple (kuti). At the far end of these are a Chinese-style building that, at one time, was used by kings during their stay in the temple. Next to this building is a storage area for disused Buddha images. 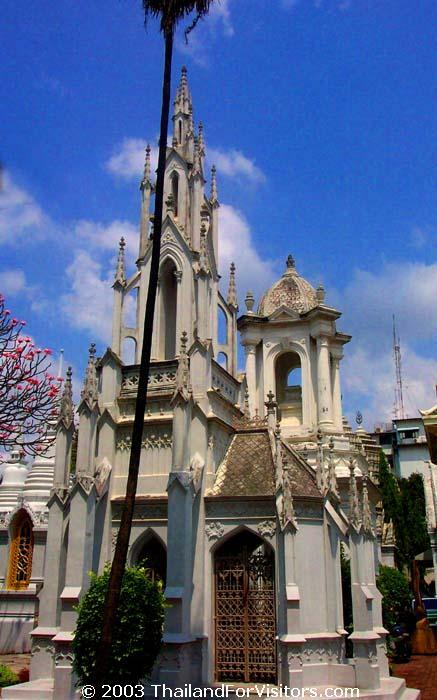 A Gothic-style chedi in the forecourt of the temple. On the west side of the temple, facing the Lawd canal, is a burial ground containing small monuments in a wide variety of styles. Most of these monuments are for minor members of the royal family. It's in these that the occasional Gothic elements of the temple itself become full-blown mini-cathedrals. In addition to the Gothic buildings, there are more traditional wiharn with gilded pagodas on their roofs. In amongst these many ancient buildings is also a modern attempt in dull brown granite. If you cross the canal using the footbridge at the north end of the temple, you'll find on the opposite side a gilded statue of a pig. The story is that the footbridge was built by one of the wives of King Rama V. For many years the bridge had no name, but since the lady was born in the year of the pig, the bridge became known by that name. The statue was erected later in her honor. The easiest way to get to Wat Ratchabophit is by boat. Take the Chaophraya River Express to the Tha Thien pier, then walk through the market and up the short street. Wat Po is directly across the intersection, on your right. Walk past Wat Po to the end of the block and cross the busy intersection. Saranrom Park is on the left and Wat Ratchabophit is just across the canal on the other side of the park. See our map of Ratanakosin for location information.